The concept of creating objects on demand using 3D-printing technology has caught the eye and imagination of artists and designers worldwide. The scope of what can be made - from mud huts to human skin to prototype motorcycle parts - grows by the day. Now, the palette of available materials for 3D printing expands still further, and will soon include composite filaments of wood, stone, iron, and bronze. L-R: Bronze, limestone, iron, and maple: the remix. 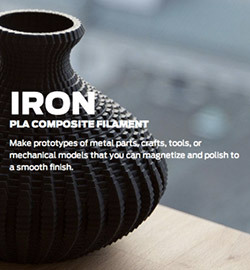 According to engadget.com, the MakerBot 3D-printing company is moving past plastics and by late 2015, will have developed printable composite filaments of maplewood, limestone, iron and bronze. The items created with these materials retain the visual look and some of the strength of the main material, but the plastic that also comprises the composite lends a lighter feel. The cavemen would be so proud of how far we've come. The physical elements of the source material retain several characteristics that would make prototype printed parts much more accurate to the real thing. Metal composites can be magnetized. Wood composites smell like wood, and can be stained, sanded and treated as normal nature-grown wood would. Can't carve? No worries, just print! Other filaments can glow in the dark or change color by temperature, but these new composites are good for more than just novelty. The wood and iron filaments create a convincing hammer (although the functionality of such a hammer is still being improved on.) The iron filaments can create nuts and bolts. All that's required to print the different materials are swappable "Smart Extruders", which manipulate the filament composites into your desired items. What could these new artistic abilities create for you?